We will be hosting a Happy Hour here at Wattage from 5:00pm-7:30pm. Enjoy drinks and delicious empanadas with friends and family. Click here to confirm your reservation. We encourage you to bring your friends for some adult beverages. 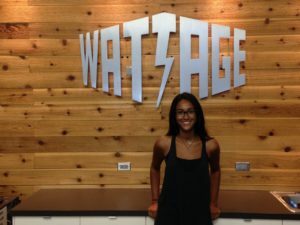 What made you want to join Wattage as a Studio Manager? I have a strong business background and have always been passionate about business development. I love finding creative ways to expand and grow the ideas and goals of a business. I am also a yoga teacher and believe the fitness industry is more than just miles and muscles, it's a lifestyle that can bring so much abundance and stability in a persons wellbeing. Seeing that Wattage truly cares about their clients health and wellbeing was the icing on the cake for me to make my decision to work here. Aaron and the team have worked hard to build strong relationships with their clients, which is absolutely amazing and inspirational. I've been to many fitness studios in Chicago and never felt a strong knit community there like I do here at Wattage. Everyone is very supportive of one another which keeps the motivation high and positive vibes thriving. Talk to Nadeya on your next visit to find out which are the truths and which one is the lie!